I am one of few fortunate people who have not had to search for a job in more than a decade. But, just in case, I’ve always had an up-to-date CV at the ready. 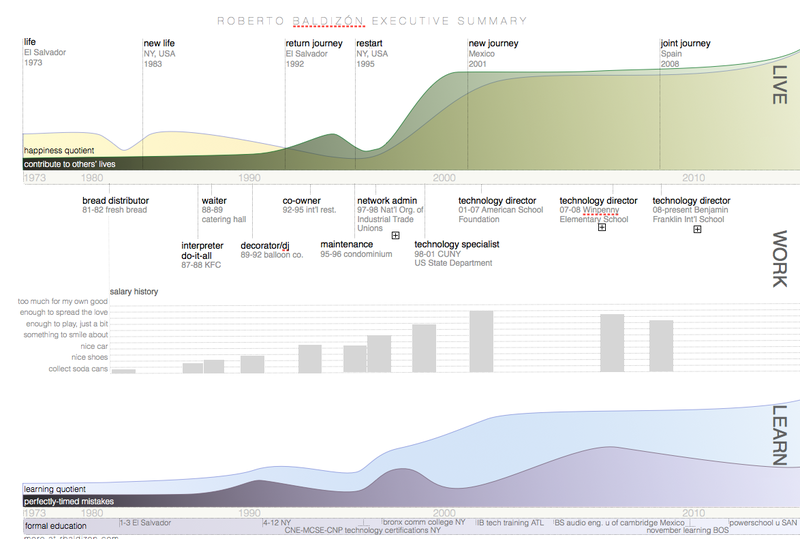 My e-CV is online at http://es.linkedin.com/in/rbaldizon. My print-ready CV I keep on Word. Still, whenever I read through either, soooo much is missing that I wish I could tell the person seeing it whenever the moment comes. So, for the past few days I’ve been tinkering with the notion of creating a life/bio summary page that will be the first page of my formal CV. After seeing it on screen, and thinking about each bit of info I’ve included I figured it would not be such a bad idea to post it here…so, here it goes. Later on I will include short capsules on this site that further explain each piece of the following document. Stay tuned! I am fortunate that when I entered into academia, entirely by accident, I did not go right into the classroom as a teacher. I came from the corporate world to work with a US State Dept. sponsored educational initiative launched by the Clinton Administration that was headquartered within the City University of New York university system. Some time after I was recruited to help an American school get their technical-house in order. I would have been an awful classroom teacher at the time, I’m sure of it. In both of those previous academic experiences I had the pleasure of working with great teachers and seeing them in the classroom. This made me hungry to be in there as well. Now that I have a few years of teaching under my belt, and quite a few friends who are former students, I can state with certainty that having classroom teaching be a part of my otherwise techie-job is the single best thing that has ever happened in my life. Education is the number one practice throughout the world that stands a chance of truly improving the lives of us all. It is through education that we have the opportunity to instill in children a sense of respect for the unknown, inquiry, understanding and awe. Awe at the possibilities of the human mind, the creative power of our brain and of the imaginative resourcefulness of our forbearers. It is through formal education that we introduce young students to the wonders of nature, the grandeur and mystery of our galaxy and to the potential of creation and imagination within them. It is my belief that in formal education teachers are placed in a privileged position. We are experts, guides, leaders, specialists, and at times, even heroes. Indeed, teachers are superheroes. With that designation comes a great responsibility to use any superpowers responsibly, and to use them to do good. It is up to us to engage and to interest. It is on us to create a channel for the energy, hunger and creativity within each student who walks into our classroom or teaching space. It is our responsibility if a student falls out of love with a subject that at first seemed interesting to them. It becomes our job to keep up with students’ pace if indeed they are interested in the subject we are teaching them, as they will want to know more and more. Teaching is an incredible specialty. Anyone who takes it lightly aught not be in a classroom. The young mind always wants to know more, wants to experiment, is eager to create, and is open to learning from mistakes. It is this last component of learning that needs to be at the top of the list of any good teacher; that students feel safe to make mistakes in the classroom. A perfectly timed mistake is the single best teacher in life, and thus should be a formal part of any classroom. Students should be fearless when entering new territory of learning, they should want to do it all, and they should have comfort in knowing that their superhero-teacher will be there to support them when they realize a mistake has been made. I love teaching!